The C.M. Russell Rustlers will see roughly a mirror image of themselves when they line up in Butte tonight to kick off the high school football season against the Bulldogs. “They’ve got quite a bit of experience back,” CMR head coach Jack Johnson said of the Butte squad. “On the offensive line, they’ve got four starters back. Their quarterback played some last year, and they have some starters back on defense. Junior Jayse McLean is CMR’s athletic quarterback. 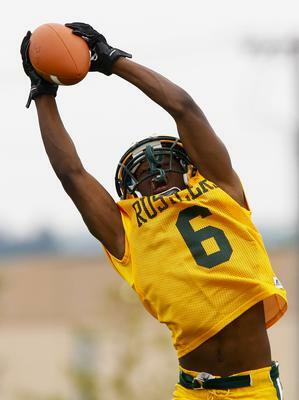 McLean, 6-foot-3, 197-pounds, will guide the Rustlers’ offense this season. McLean will be protected by a sizeable offensive line, which Johnson says will be the Rustlers’ benchmark this year, with five of six returning starters back from last year. Junior Jimmy Grinde and seniors Isaak Thornton, Connor Cappis, Dylan Mahoney and Josh Horner all started last year on the O-line. The formidable and veteran front will also block for senior running back Hunter Thomsen, who rushed for 1,250 yards on 221 carries last season during a breakout junior campaign. This year, junior running back Eric Dawson, who missed last year with an injury, will look to help lessen Thomsen’s load in the backfield. Last year, both the Rustlers and Bulldogs finished with 5-6 records and were ousted in the opening round of the Class AA playoffs. Starters Tanner Levandowski, Jake Horton, Colton Philp and Austin Kinaman will anchor the secondary. The Rustlers aren’t taking the Bulldogs lightly, even with the state’s top-ranked team, Kalispell Glacier, on the schedule for CMR next Friday on the road. “I think we’ve got our work cut out for us with Butte,” Johnson said.